IMPORTANT: BEFORE INSTALLING MAKE SURE YOU TOUCH THE ORGAN METAL POWER DISTRIBUTION BOX TO DISCHARGE ANY STATIC YOU MAY HAVE PICKED UP BY MOVING. YOU MAY NEED TO REPEAT EVERY TIME YOU MOVE AWAY FROM THE CONSOLE!!!!! For MOS organs follow the instructions below. For other organs install before the expression control circuitry if possible. Lift the top of the console to access the rear panel release clips. Locate the DAC board (Allen Mos Organs for other organs and models please supply a block diagram or a description of your organ so we can provide specific instructions.) Mount the Traveling Wave Generator close to the DAC board allowing sufficient room for the cable adapters and cable ends. If you drill a pilot hole be sure that you don’t run the drill bit through circuit boards that may be on the other side of the wood panel. Disconnect the RCA cable from the “main” DAC board channel and plug it into the right jack of the Traveling Wave Generator (TWG). The lower left jack on the Traveling Wave generator is the bypass jack to be used if you have an extra channel and want a blend. 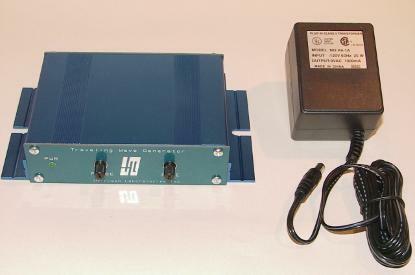 Using the short RCA cable supplied, connect the right jack of the Traveling Wave Generator to the DAC main jack. Next plug the TWG power pack into a spare AC receptacle if one is available. If not, use a short extension cord and remove one of the plugs in the distribution box and use the extension cord. If you have turn-on/turn-off pops, use an un-switched AC outlet. The small power drain will not hurt and you can leave this item powered continuously.